This past week I had the opportunity to speak to New York City high school principals about writing. And as I did a while ago when I looked at how colleges view close reading, I decided to do a bit of research into what colleges were actually looking for in writing for my presentation. As happened then, when I found a significant difference between what colleges expect students to do as close readers and the often formulaic “three goes” at a text with text-dependent questions approach that I see in many schools, I discovered some significant gaps between how we teach writing—especially argument—and what colleges are looking for. And these gaps have enough implications for lower and middle school, as well as high school, that I thought I’d share what I found. I wish I could say things were different in the States, but we, too, seem to spend a lot of time teaching students how to organize and structure their writing without spending equal, if not more, time in teaching them how to develop ideas in the first place. And from about third grade right up to twelfth, much of the teaching around organization and structure is focused on the five-paragraph essay, where some students are taught not only how many paragraphs their essays should have but how many sentences each of those paragraphs should contain as well as the content of each. This all seems to suggest that even with the Common Core Standards’ focus on college and career readiness, we might not be doing such a great job at preparing students for college writing. To close that gap, though, we need a clearer vision of what colleges do expect, and coincidentally—or serendipitously—enough, Grant Wiggin’s shared one of his college freshman son’s writing assignments in his recent blog post on argument, which does just that. In my next post, I’ll share some of the ideas and practices I explored with the principals last week, including the use of low-risk writing to help students take on that more exploratory stance and of mentor texts to give them both a vision and some choices about how their writing could look like based on what they have to say. But for now I want to offer one more reason why we might want to reconsider giving students a one-size-fits all structure for academic writing. 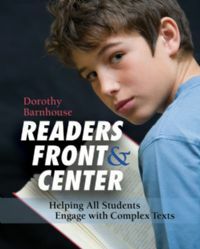 As I wrote about earlier, when we offer students scaffolds, we often inadvertently deprive them of something—in this case, the opportunity to engage and wrestle with one of the big concepts in reading and writing: how form informs content and how content can shape form. This concept is what lies underneath the Common Core’s Craft and Structure Standards in reading, and by inviting students to think about what form might best suit and convey what they’re trying to say, we’d helped them become more aware of the purposefulness of a writer’s choice of structure. And in that way, too, they’d reap what Bird by Bird author Anne Lamott says is the big reward of writing: “Becoming a better writer is going to help you become a better reader, and that is the real payoff.” It will also ensure that students won’t have to un-learn what we’ve taught them once they get to college.